The universe cracks. That’s how you feel when a beloved family member is violently torn from this world while she or he is at prayer. 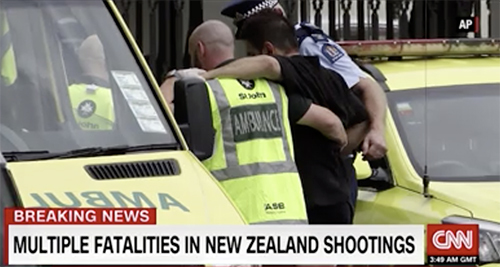 That’s how nearly 50 families, half a world away, feel right now in the wake of Friday’s violent attacks on two mosques in Christchurch, New Zealand, which claimed the lives of at least 49 people. I know because only six months ago, I was in their shoes. It’s like I am stuck in a cruel time machine taking me back to October 27, 2018, when my mother-in-law, Joyce Fienberg, was among the 11 Jews murdered at the Tree of Life synagogue in Pittsburgh. No one—no matter one’s religion, age, color, anything—should be harmed in any way while peacefully praying in a house of worship. To the families that are reeling, I want to say that we in the Jewish community are your siblings; we are all children of Abraham. We are appalled at this attack and mourn your loss deeply. We pray for peace, and I personally will pray today that your families are sitting beside Allah in paradise. In October and November, the biggest gift that the Pittsburgh community gave to my family was space and deep love. We had space to mourn—the reporters and politics were kept away from us in a bubble made of love and unbreakable Pittsburgh steel. We continued to feel this love through boxes and boxes of letters, stories, poems and even quilts—all sent to us from strangers around the world, including our friends in the Muslim community. This ongoing love is what still helps me get out of bed every day. Today, I don’t have an answer, any more than I did six months ago. Today, all I have are tears. Tomorrow, maybe, we can all work together to find a solution and a way to protect all of us, especially when we are at our most vulnerable. Marnie Fienberg, a co-president of the Northern Virginia Chapter of Hadassah, is a strategic planner and communicator. She is leading a grassroots program to fight anti-Semitism and hate called 2 for Seder. So sorry for your loss. Your words of condolence are so very aporopriate. Murder while anyone is worshipping is horrible. My dear husband, born of the Islamic fairh died unexpectedly of matural causes on October 26 last year. A few days later, a Mullah and a Rabbi co-officiated at his funeral in Maryland because I am Jewish. We were blesssd with than 40 years of marriage and totally respected each other in every way. God bless you a d your fanily and the victims and famies of those injured and murdered ib New Zealand.